Hi, friends. 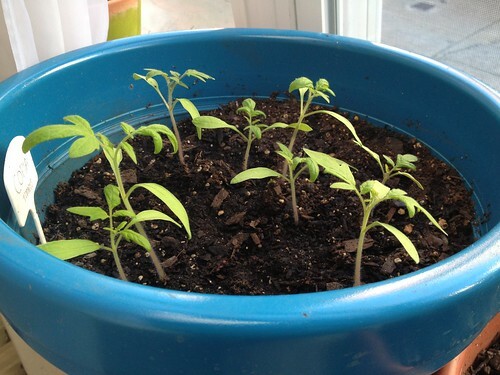 Little tomatoes are coming along! Look, they're even beginning to look like actual tomato plants: [caption id="" align="alignnone" width="500" caption="Lil' Copias"] [/caption] But the best thing this past week has been my greens. Check out my one surviving chard! 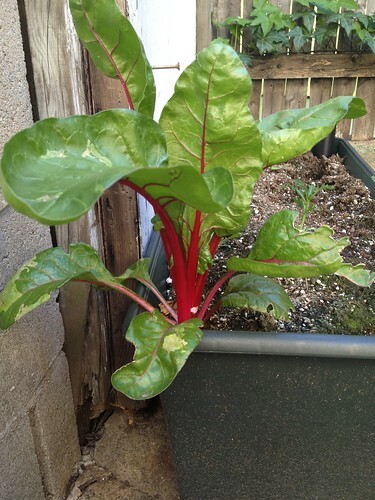 [caption id="" align="alignnone" width="375" caption="beauty"] [/caption] This one little (not so little anymore) chard survived the too-wet soil and winter and now is looking good! I absolutely love those bright red stems. I'll definitely be planting more of these and some more kale either in the late summer (for fall harvesting) or fall (for spring harvesting.) 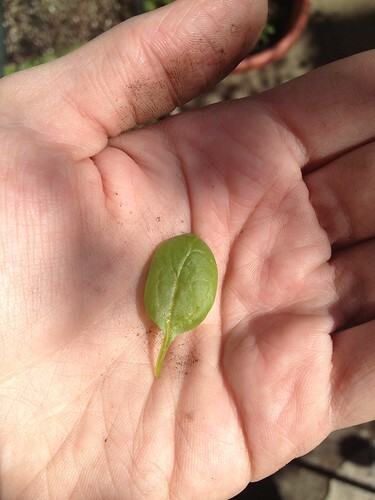 And... [caption id="" align="alignnone" width="375" caption="baby baby spinach"] [/caption] My first little spinaches! And they taste good! I feel like I could eat them now and call them "microgreens" (which I do when I'm thinning out the arugula and want to feel fancy, ie all the time) but I'm going to let them get a little bigger. I have a few new plants to introduce to you but they are still settling in so we'll see them next week. Patience!